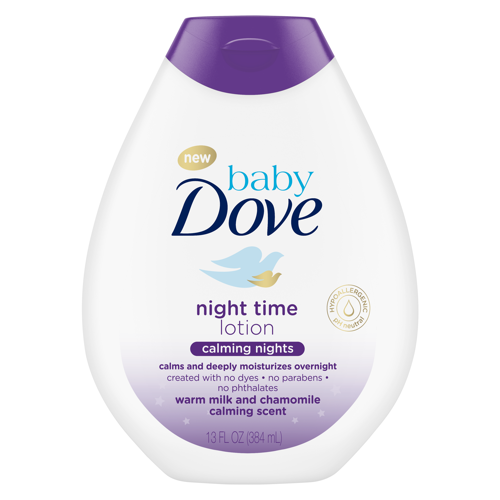 Introducing the NEW Baby Dove Calming Nights Range! Home Beauty	Introducing the NEW Baby Dove Calming Nights Range! Calming Nights Baby Lotion- Specially formulated with a calming scent of warm milk and chamomile to help babies relax before bedtime. Made with 100% skin-natural nutrients and gentle moisturizers for 24 hours of moisture. Contains nutrients that are identical to those found naturally in skin. Soothes dry skin from ﬁrst use. Leaves baby’s skin feeling soft and delicately scentedMild and caring formula. Created without dyes, parabens or phthalates. Dermatologist and pediatrician tested, Hypoallergenic, pH neutral formula.